After you create one or more Aurora Serverless DB clusters, you can view which DB clusters are type Serverless and which are type Instance. For each Aurora Serverless DB cluster, you can view the current number of Aurora Capacity Units (ACUs) it is using. Each ACU is a combination of processing and memory capacity. In the upper-right corner of the AWS Management Console, choose the AWS Region in which you created the Aurora Serverless DB clusters. For each DB cluster, the DB cluster type is shown under Type. The provisioned DB clusters show Provisioned for the type, and the Aurora Serverless DB clusters show Serverless for the type. You can view an Aurora Serverless DB cluster's current capacity under Size. Choose an Aurora Serverless DB cluster name to display details about the DB cluster. Note the database endpoint, because it's required to connect to the DB cluster. A scaling event is generated when the DB cluster scales up, scales down, pauses, or resumes. The following image shows examples of these events. You can also monitor your Aurora Serverless DB cluster in CloudWatch. In particular, you can monitor the capacity allocated to the DB cluster with the ServerlessDatabaseCapacity metric. You can also monitor all of the standard Aurora CloudWatch metrics, such as CPUUtilization, DatabaseConnections, Queries, and so on. For details about how to monitor Aurora clusters through CloudWatch, see Publishing Amazon Aurora MySQL Logs to Amazon CloudWatch Logs. You can have Aurora publish some or all database logs to CloudWatch. You select which logs to publish by enabling the configuration parameters such as general_log and slow_query_log in the DB cluster parameter group associated with the Serverless cluster. Unlike provisioned clusters, Serverless clusters don't require you to specify in the cluster settings which log types to upload to CloudWatch. Serverless clusters automatically upload all the available logs. For information about enabling the log configuration parameters for Serverless clusters, see Aurora Serverless and Parameter Groups. For information about monitoring Aurora clusters through CloudWatch, see Publishing Amazon Aurora MySQL Logs to Amazon CloudWatch Logs. To connect to an Aurora Serverless DB cluster, use the database endpoint. 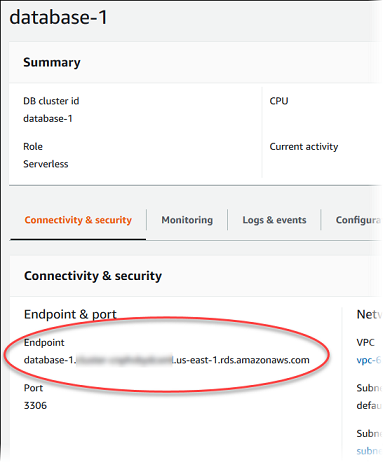 Follow the instructions in Connecting to an Amazon Aurora DB Cluster to connect to your Aurora Serverless DB cluster. With Aurora Serverless, you can't connect directly to specific DB instances in the DB cluster.